I've just finished reading, Courtiers, The Secret History of Kensington Palace, by Lucy Worsley, and for all of you history buffs out there, and for those of you who want to become one, I can't recommend it enough! Kensington Palace is now most famous as the former home of Diana, Princess of Wales, but the palace's glory days came between 1714 and 1760, during the reigns of George I and II . In the eighteenth century, this palace was a world of skulduggery, intrigue, politicking, etiquette, wigs, and beauty spots, where fans whistled open like switchblades and unusual people were kept as curiosities. 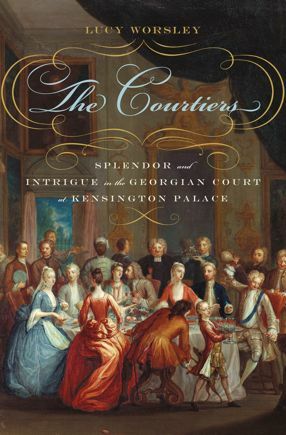 Lucy Worsley's The Courtiers charts the trajectory of the fantastically quarrelsome Hanovers and the last great gasp of British court life. Structured around the paintings of courtiers and servants that line the walls of the King's Staircase of Kensington Palace—paintings you can see at the palace today—The Courtiers goes behind closed doors to meet a pushy young painter, a maid of honor with a secret marriage, a vice chamberlain with many vices, a bedchamber woman with a violent husband, two aging royal mistresses, and many more. The result is an indelible portrait of court life leading up to the famous reign of George III , and a feast for both Anglophiles and lovers of history and royalty. Kudos to you Ms. Worsley! I personally enjoy reading historical factual books because I'm obsessed, but for some people reading history books can be a bit of a bore. Rest assured, when you pick up this book, you won't be bored! (and if you are, for shame!) Ms. Worsley has a natural story telling voice, which was active, inviting and intriguing. She tells the story of Kensington Palace and its inhabitants during a time period I have had a brief introduction to before, but am now fully informed of, and things that I never would have found on my own. I think this is what most intrigued me about the book, it wasn't just the story of the kings, queens, princesses, and other royals, but covered the lives of those who traipsed through the palace daily--servants too! And all of them held secrets. The book brought to life that saying, "If these walls could talk..." and apparently they did talk to Ms. Worsley, and we are lucky enough to hear what they said. The book also comes with pictures, which pleased me immensely! While I do have a vivid enough imagination to picture the people and palace on my own, seeing it while reading it makes the book that much better. This is definitely a keeper for me! And I have to say thank you to you Ms. Worsley, in casual conversation the other day, someone wondered when the English monarchs came from Germany, and because I'd read your book, I knew exactly when. I look forward to reading your future works and stockpiling your backlist. Every once in a while I like to dig into a good piece of non-fiction -- this sounds like one I should remember! I'm especially interested in the life of the servants -- palace life wasn't romantic or exciting for everyone! It was really good! Let me know what you think! I'm with Audra... I typically prefer to read historical fiction such as my latest read, "Blood Soup" by Kelly A. Harmon, (which is a great match for anyone who likes historical fiction, medieval fiction and fantasy), but I would definitely give this book a try. Looks intriguing. Hi Eliza! I too adored this book, and found all the little tidbits fascinating. The book is so delicious that I had to sort of parcel it out like really good chocolate. I can't wait for my next trip to Kensington Palace. It will be so much richer the next time. I am going to get this book! I toured Kensington Palace in about 2005 and got to see the clothes and apartments, which I think are closed down now. I often wondered what it was like way back when. So now I can learn a lot. Thanks for the post.